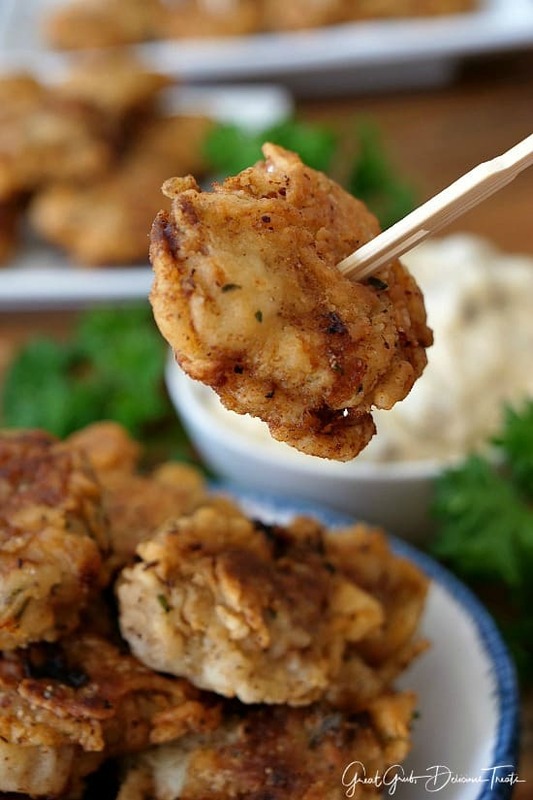 You are going to flip over these little chicken fried steak bites, especially if you are a lover of chicken fried steak. 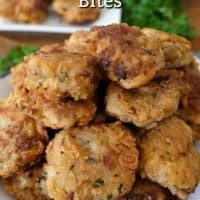 These chicken fried steak bites are crunchy, seasoned just right, fried to perfection and are a delicious and easy appetizer recipe perfect any time of the year. And they’re great for gameday, tailgating and Superbowl parties. 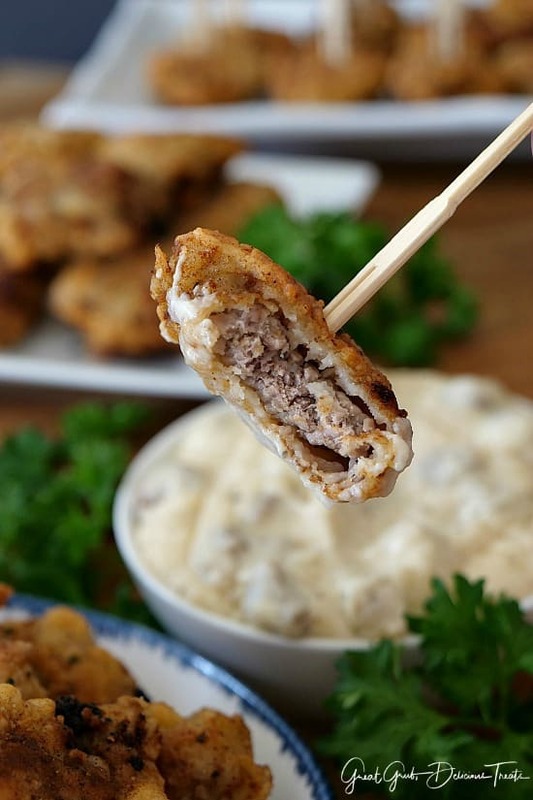 One of my all time favorite comfort foods is chicken fried steak and these little bites are just as delicious and pure comfort food at it’s best! These are perfect to serve when the gang comes over to watch the game, or when the family comes over for a Sunday dinner. 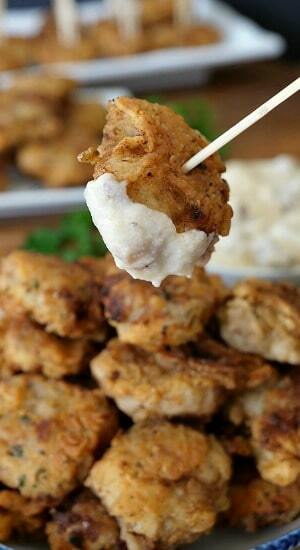 A delicious appetizer everyone enjoys. 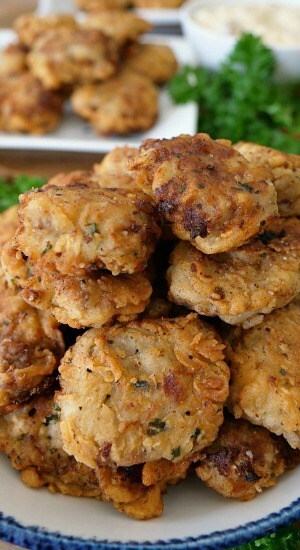 And then to top it off, smother these little bites of heaven in country gravy… yum, yum, yum! The seasonings are what makes these so flavorful. Feel free to add more spices than what’s listed in the ingredients for additional flavor. Cayenne pepper is also good to add to the seasoning line up for some additional spiciness. And, my chicken fried steak fingers are a huge hit with everyone that has ever eaten them. Rave reviews from everyone! What Kind Of Steak Do You Use For Chicken Fried Steak? 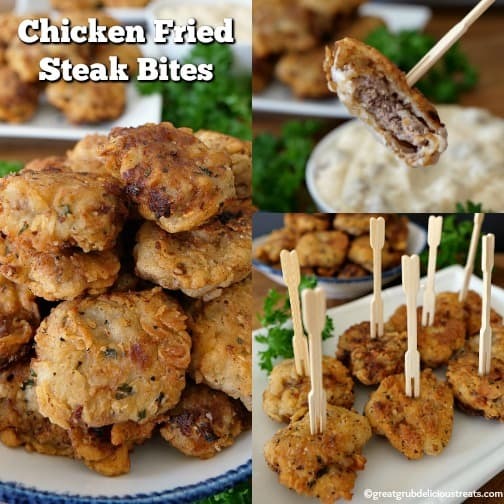 Chicken fried steak, as well as these steak bites, are made with cube steak. For this recipe, a pack of six medium cube steaks will be perfect. 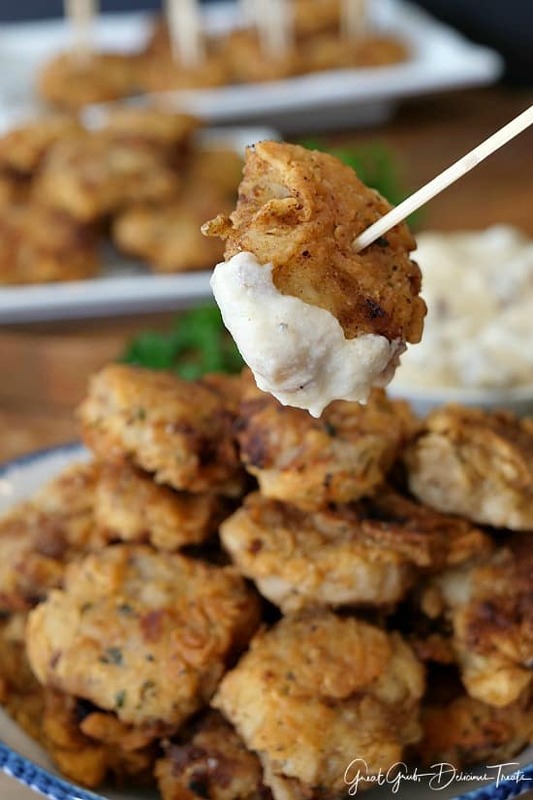 Let me show you how easy it is to make these yummy little chicken fried steak bites. Using a large cast iron pan, or an electric skillet, heat oil to 375°. Cut cubed steaks into 1 1/2 inch squares and place on a plate lined with paper towels to soak up any excess liquid. As you cut the steaks into squares and fill the plate, add another layer of paper towels. Continue stacking steak bites with paper towels in between layers to absorb the liquid and pat dry. While the oil is heating up, add 1 1/2 cup of flour into a large baggie. Add the remaining 1 1/2 cups of flour in another large baggie plus add all the spices and seasonings, seal and shake to mix. In a medium mixing bowl, whisk eggs, hot sauce and buttermilk together. Once the oil is ready, pat dry the bites again and place about 10 steak bites into the baggie with the plain flour, seal and shake to coat. Next add the bites to the egg mixture, then into the baggie with the flour and seasonings. Carefully place each piece into the skillet and fry until golden brown on both sides. After the first batch of bites are cooked, place them on a plate lined with paper towels. Place the plate into a preheated oven at 175° to keep warm while the rest of the steak bites are being cooked. Repeat the coating process for the remaining steak bites. For best results, make sure to coat the steak bites right before going putting them into the skillet. And finally, serve with your favorite country gravy. 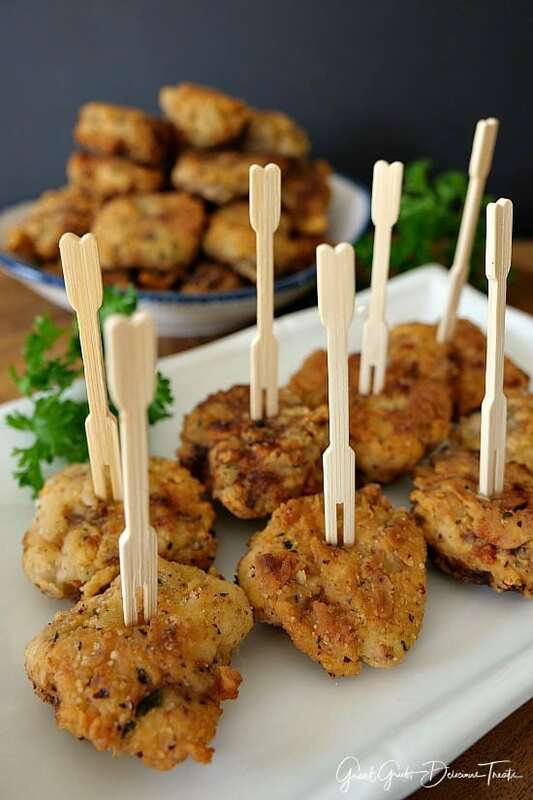 Here are a few more delicious appetizers that can be found on the blog: Chicken Cordon Bleu Bites, Hot Corn Salad, Mini Baked Parmesan Potato Rounds, Parmesan Crusted Lemon Chicken Strips, plus many more. Cut cubed steaks into 1 1/2 inch squares and place on plate lined with paper towels to soak up excess liquid. As you cut steak into squares and fill the plate, add another layer of paper towels and continue stacking steak bites with paper towels in between layers to absorb excess liquid and pat dry. 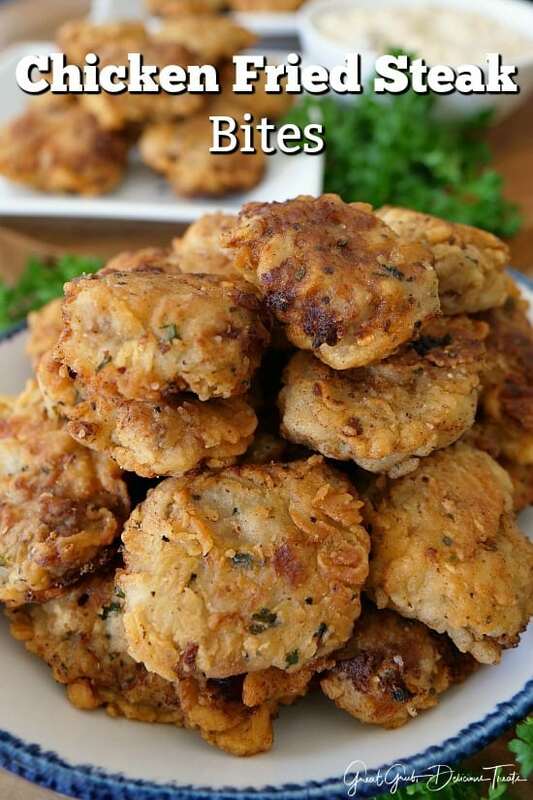 Once the oil is ready, pat dry bites again and place about 10 steak bites into the baggie with the plain flour, seal and shake to coat. Next add the bites to the egg mixture, next into the baggie with the flour and seasonings, then into the skillet. Once the first batch is cooked, place on a plate lined with paper towels and place into a preheated oven at 175° to keep warm while the rest of the steak bites are being cooked. Repeat the coating process for the remaining steak bites. For best results, make sure to coat the steak bites right before going into the skillet. What is the recipe for “slap ya mama” seasoning?